Paul came to us after searching on the Net and taking Recommendations, that was nice to hear! 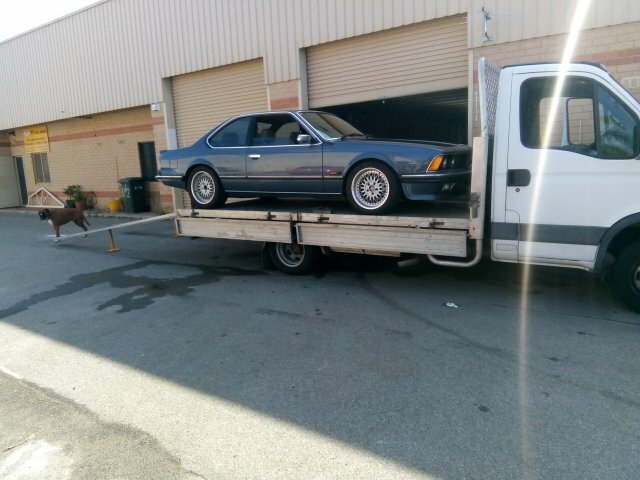 Paul’s 1984 BMW 635CSi has quite a nice history in Perth, even thou he had to grab this bargain from way up North!! 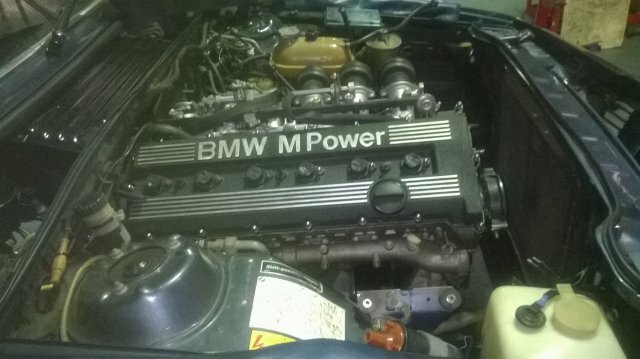 Already a 5Speed manual ,we didn’t need to reinvent the wheel, this beautiful e24 has a Dogleg Getrag 265-5 gearbox , LSD and M635 brake upgrades from previous owners! 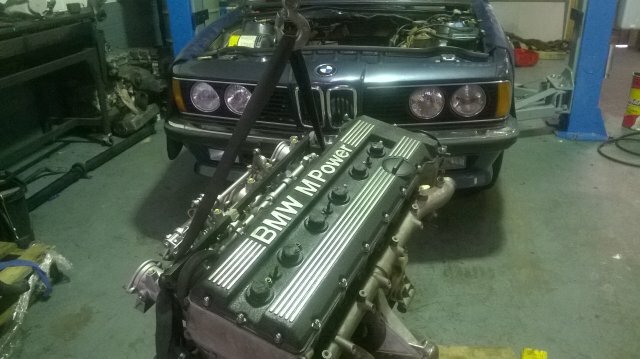 After purchasing a partially cannibalised M5 e34 motor used in a failed attempt in a conversion with aftermarket EMS , Paul went on the hunt for all original externals needed to run as a BMW again! 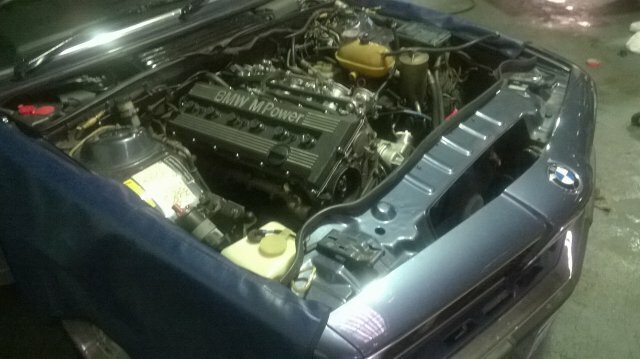 we already got the new engine harness and ECU but needed disi’ and ignition system bits. 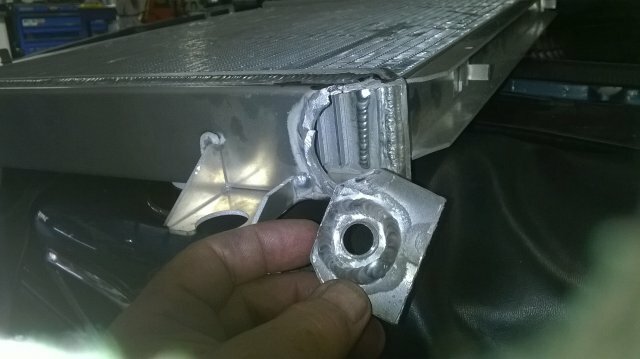 Paul spent afew months gathering and cleaning till it was time to do the conversion! 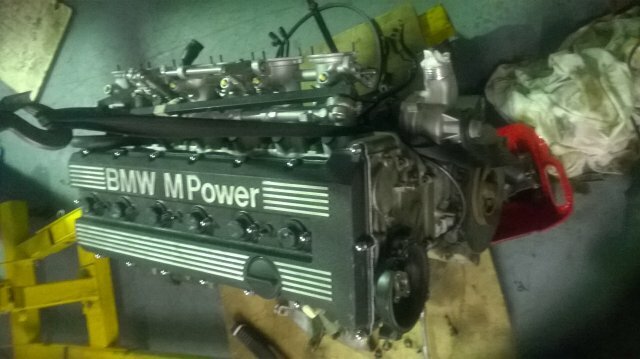 Update 10-2016- Old M30B35 motor out and parts swap to S38 with new bits along the way …Motor, Gearbox, tailshaft and Gearshift linkage in the car! 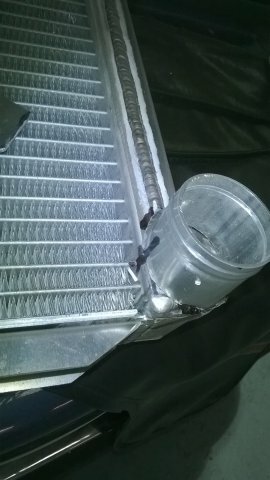 next to look at the Extractors! 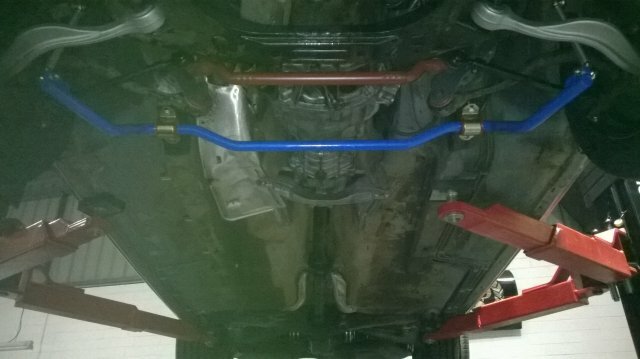 Update 11-2016- In the meantime the front swaybar mounts modified/welded in and shinny new blue bars fitted front and rear, Paul (Electrical Engineer) has researched and done his own wiring loom to suit…later this month the factory s/s extractors will be modified to fit e24! 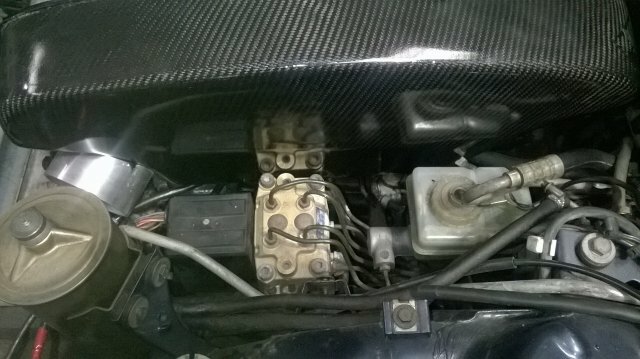 So turning to the fitment of the Carbon Fibre Airbox we needed to shift the ABS unit down and out of the way and remove the plastic brake reservoir ,from the top of master cylinder to a BMW Remote type alongside the system. 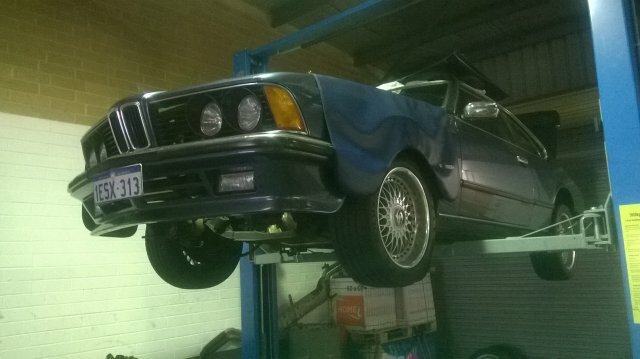 Update 12-2016- The car is now back from Andy doing the primary pipes to suit e24…….now late December have to wait for everyone to get over the festive season!! 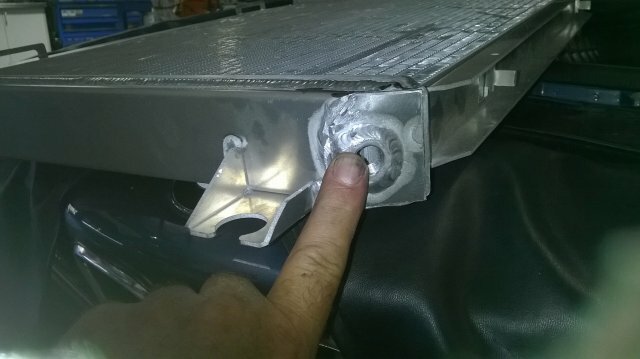 Update 1-2017- After bolting back on the old m30 exhaust system ,minus the front pipes and headers ,the car is back from Jeff getting the connection between the headers and his original exhaust system done!…Now Paul is having the headers ceramicoated for head reduction in the engine bay, while we look at the ABS unit to clear the Carbon-fibre Airbox Engine bay issue! 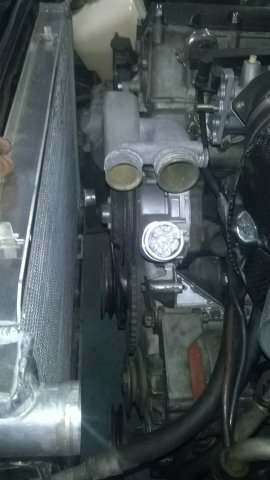 Update 2-2017- Exhaust system full finished and fixed to the e24! 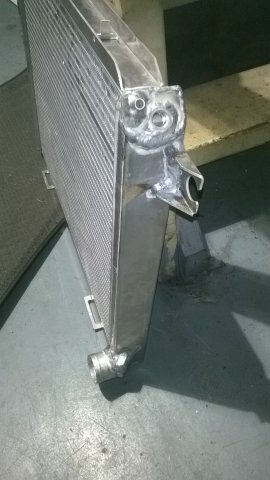 Update 4-2017- Radiator modified and looks how it should in position now, alloy water bypass and top hose connector modified to look “Factory ” works well, Carbon Airbox is free of other bits in the Engine bay, ABS moved down and to one side with brackets nearly done, heater tap will be slightly moved downwards to clear rear of CF Intake. 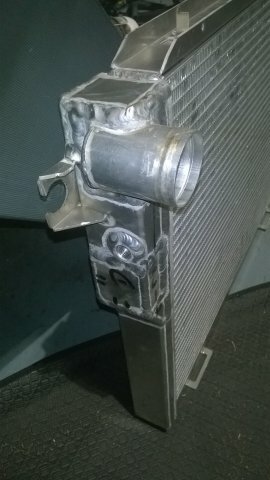 Update 11/2017- ABS bracket has been made, Radiator fitted with hoses found,Pauls wiring has been looked at and tested! 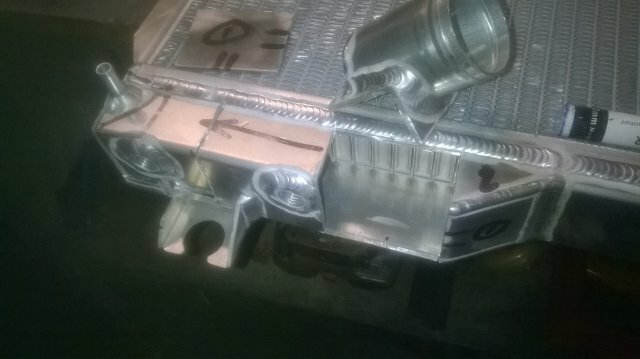 Update 12/2017- ABS Bracket welded to the body and checked for clearance to c/f Airbox…tick! 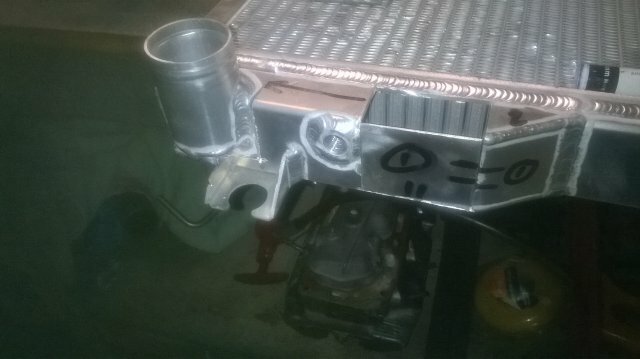 Update 2/2018- ABS brackets done and welded in, as is oxy sensor welded into centre muffler as factory do, brake reservoir brackets done but brake system bleed with plastic push-ins on master cylinder next, then radiator overflow bottle and pipes, air mass and cleaner left….! 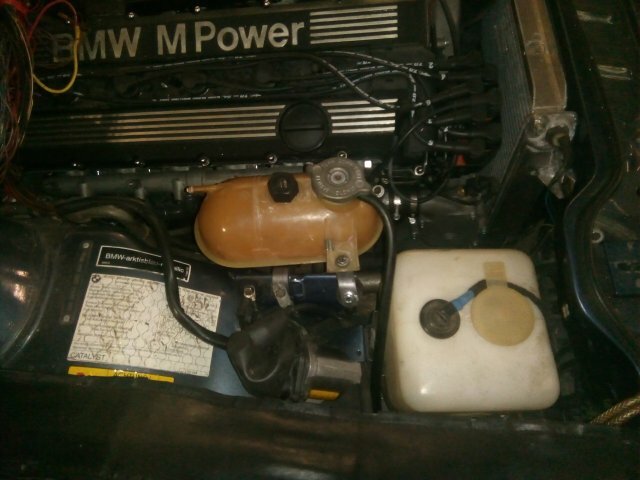 Update 5,6/2018- Time to finish off the straggly bits!….No aftermarket overflow bottle found, so onto using what we have…an e30M3 one looks the goods! 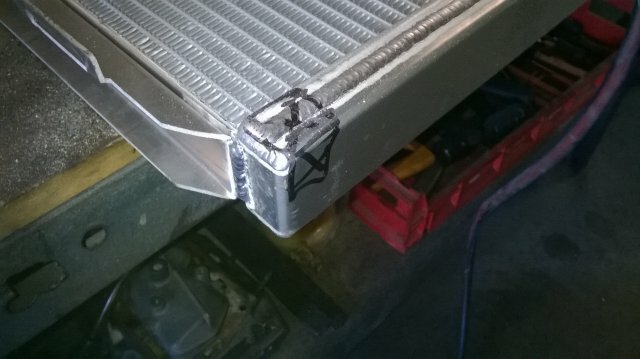 heater hoses and custom bleeder ‘T’ piece with radiator plug up and onto fitting Carbon fibre air box ! 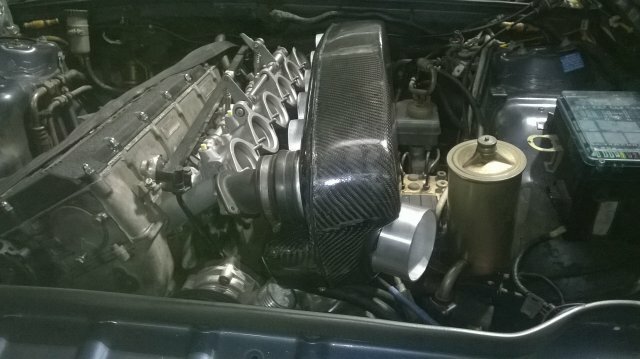 Update 7/2018- With the Overflow header bottle in and hoses connected, it is onto dipstick modification to fit C/F Airbox in, we need to re-invent the wheel here to redo’ the Carbon fibre box to suit the s38 upgraded motor, breather hoses and fittings, this means boring a couple of large holes in the C/F box to take the rotary idle valve hose and oil breathers! 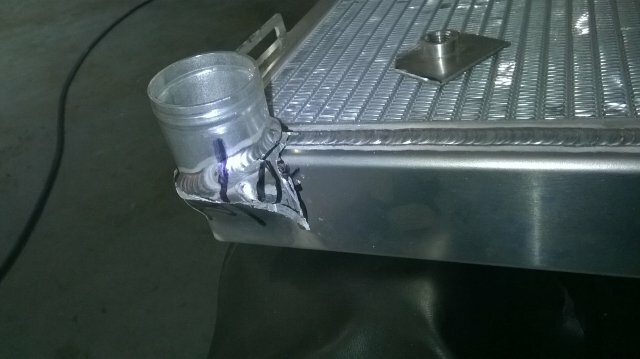 Update 8/2018- Now the Carbon fibre airbox has the correct placed holes for oil breathers, we can fit permanently, then onto air cleaner set up! 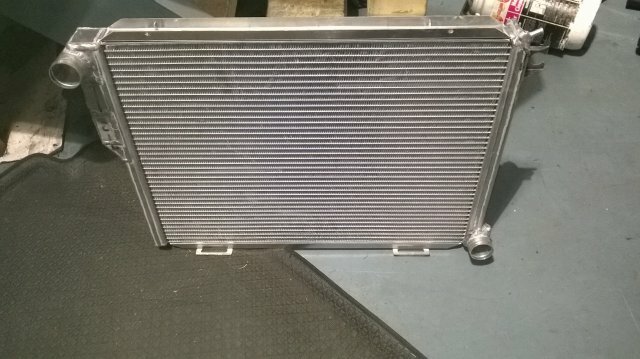 Update 9&10/2018- Air cleaner set up, hose and pipe final check, fresh fuel ….Engine starts! 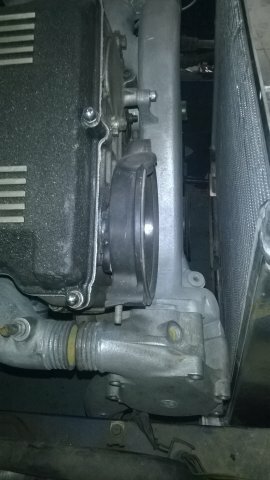 !…We have Noise! 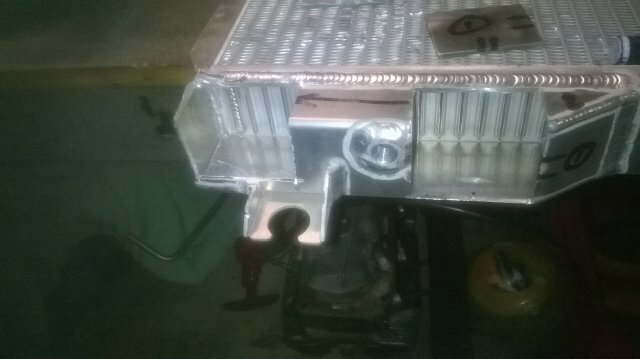 !….Just a Final check and its off to Paul’s so he can complete his wiring!